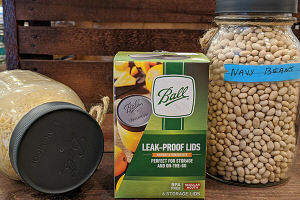 Screw-on plastic caps turn regular mason jars into practical storage containers for dried foods, leftovers or household items. After opening home canned foods, replace the two piece caps with these plastic caps to store leftovers. Each box includes 8 reusable dishwasher-safe plastic caps. Fits either Ball or Kerr mason canning jars. Please note: These storage caps are not intended for heat processing.